Best selling author Jayne Seagrave is back with a brand new book: All the World’s a Stage: The Story of Vancouver’s Bard on the Beach - a celebration of the twenty-eight-year history of Western Canada’s most illustrious Shakespeare festival. Well known writer and Bard aficionado Jayne Seagrave goes behind the scenes to discover what makes the festival tick. The story of Bard on the Beach unfolds in five “acts” highlighting the people, history, growth, and future of this unique theatre company and features dozens of full-colour photographs of sumptuous sets, elaborate costumes, tireless volunteers, actors in mid-soliloquy, and more. 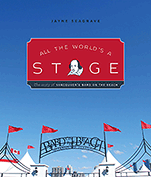 All the World’s a Stage is a stunning, informative, and entertaining keepsake for Bard on the Beach fans new and old. With the unique combination of being a best selling travel writer, successful international Entrepreneur and extensively published academic, Dr. Jayne Seagrave is an eclectic woman who has a wealth of experience and talents in a number of areas. Her infectious personal attributes coupled with a energy, enthusiasm, joie de vive and desire to convey her knowledge and experience to others has resulted in a diverse career. Although primarily an entrepreneur, Jayne is probably best known as a travel writer with extensive expertise on camping in Western Canada, and more recently on women’s solo travel with her book Time to Take Flight: The Savvy Woman’s Guide to Safe, Solo Travel. See more at Jayne's Time to Take Flight blog: timetotakeflight.com . Jayne's latest project has been documening the history and success of Bard on the Beach, the immensely successful Shakespearean theatre company. See the festival's home page here: bardonthebeach.org . Her primary employment is as Marketing Director for The Vancouver Tool Corporation a company she established with her partner in 1996. Vancouver Tool has successfully managed to market and sell a number of patented inventions for the home improvement industry to every major home improvement retailer in North America. Over 30 million of their tools have been sold worldwide. A selection of Jayne Seagrave's published books.